The first product is sure to thrill any lady, especially those who love diamonds and perfume! It is the new perfume from Tiffany and Co, which is housed in the classic Tiffany blue box. Inside is a very feminine and sophisticated perfume, housed in a bottle, which looks like the classic Tiffany diamond. I would describe the fragrance itself as sparkling - it isn't harsh in any way. It is both floral and musky due to the notes of vert de mandarin, iris and patchouli. A sophisticated scent for a sophisticated lady and an affordable way to have some Tiffany in your life! It comes in 3 sizes: 30ml, 50ml and 75ml. UK/Ireland. Next up is a gift for those who work out a lot, have active, physical jobs or tired parents! Elemis Aching Muscle Super Bath Soak is a real treat! A few capfuls of this product added to bath water will revive the most tired and overworked bodies. Both relaxing and uplifting, it helps to relieve aching limbs and restore mental clarity. It really is like a massage in a bottle! Your loved one will really thank you for this gift! UK/Ireland. For the skincare lovers, this GLAMGLOW Thirstymud Face Mask Skincare Christmas Gift Set is a great option! It contains four masks to answer all skin issues - Supermud, which deeply cleanses the skin to clear pores and prevent spots, Youthmud to exfoliate for bright and radiant skin, Gravitymud - a peel off mask to firm the skin and Thirstymud, which intensely hydrates the skin - a winter essential! UK/Ireland. An eyeshadow palette that will cover every look is the Urban Decay Limited Edition Heavy Metals Eye Shadow palette. This palette is unique in its packaging with a mirror in the middle and 10 eyeshadows either side of it (20 in total). There are so many options in this palette - gold, copper, burgundy, beige, purple, grey, green, yellow and more so the possibilities are endless! It's sure to be a hit with any makeup fan, plus the fact that it's limited edition makes it even more special! UK/Ireland. 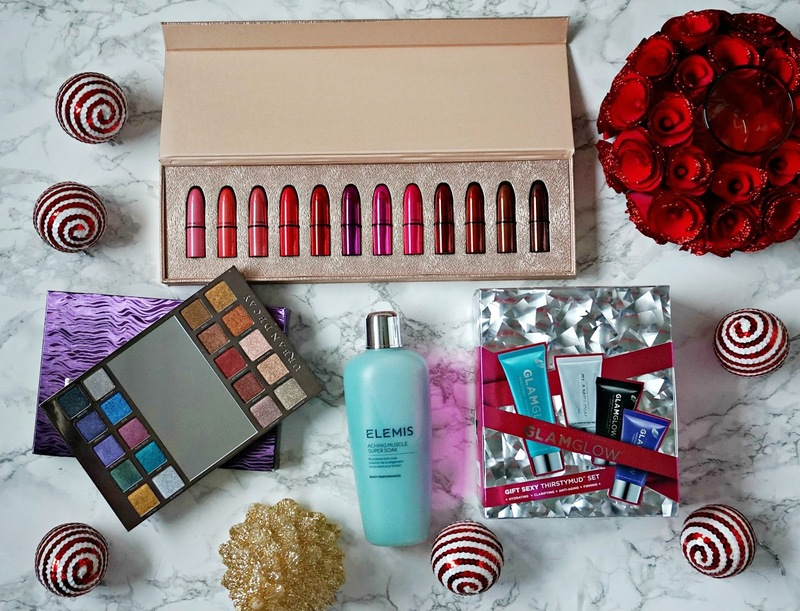 Finally, the ultimate dream gift for any makeup fan has to be the MAC Snowball mini lipstick set! Everything about this set is perfection - from the rose gold case to the 12 classic lipsticks inside. I love that the case of each lipstick corresponds to the colour of the lipstick inside. All of the classic shades are in here, including Rebel, Diva, Velvet Teddy, Ruby Woo, Flat Out Fabulous, Whirl and many more. Prepare to see eyes pop when this gift is opened! UK. I hope that this has served as inspiration for last minute shoppers, or even better, for a treat to you, from you! Don't forget that Debenhams offer next day delivery up until the 22nd and there is always the Click and Collect option available too! Have you finished your shopping yet or do you prefer doing it last minute to embrace the hustle and bustle and Christmas atmosphere in stores? I'd love to hear! All products are bought by me, unless otherwise stated. All of these products were kindly provided by Debenhams, however this is not a sponsored post. Opinion is always my own.